Duke freshman R.J. Barrett is ready for his homecoming games — and his college career hasn't even formally begun yet. 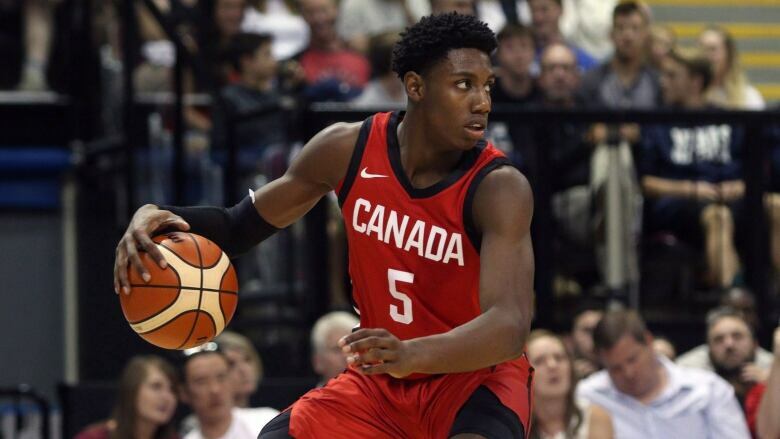 One of basketball's most legendary coaches calls Canadian R.J. Barrett an "outstanding player." But it's Barrett's maturity that truly impresses Mike Krzyzewski. "He's kind of old school, he had such a winning mentality, and it translated to the guys playing with him," Krzyzewski said of his first impressions of Barrett. "Obviously he's talented and can play all over the court, but I loved his strong face, how he led his team, he just looked older and in command. "And the little bit I've had a chance to work with him, I've found that to be very true." Barrett, an 18-year-old from Mississauga, Ont., will suit up for Krzyzewski for the first time next week when the Duke Blue Devils play three pre-season games in Canada versus the Ryerson Rams, the University of Toronto, and McGill Redmen. The series' first two games — Wednesday versus the Rams, and Friday vs. the Varsity Blues — are all but sold out at the Paramount Fine Foods Centre in Barrett's virtual backyard. Fans are eager to get an early look at the six-foot-eight forward who's the presumptive first overall pick in the 2019 NBA draft. Krzyzewski, who's seen some of college basketball's greats come through Duke's doors — Kyrie Irving, Grant Hill and Jayson Tatum are just a small sampling — spoke at length about Barrett's poise, and ability to rise to the occasion. Proof of that came in the summer of 2017, when he led Canada to a historic gold medal at the FIBA U19 world championships as one of the tournament's youngest players. "The kid's a winner, and an outstanding player," the coach said. "He wants to be special. He's engaged every second with you, and he's smart, off the court [he's] fun, very intelligent, he's way ahead of his years as far as maturity, a very very mature player." Barrett, meanwhile, said making his debut for Duke in his hometown is "very surreal," And while there will be plenty of attention on the teenager next week, Barrett says his new teammates help him stay focused. "It's not hard for me, because we have a lot of guys on the team, they keep me grounded, they keep me going," Barrett said. "Everybody has something on their plate, so everybody just helps out." On Friday's conference call, he was asked about everything from being bilingual — "I can still speak [French] fluently, I'm a little rusty though" — to his Canadian NBA heroes. He grew up watching his godfather Steve Nash, as well as Minnesota forward Andrew Wiggins, who he says "kind of paved the way for us young guys in Canada." Barrett, the centrepiece of the NCAA's consensus No. 1 recruiting class, flew to Durham, N.C., to join his new team hours after he helped Canada advance to the second round of World Cup qualifying with a 99-69 win over the U.S. Virgin Islands in Ottawa. The experience set him up for a smooth transition. "It definitely has helped me a lot, being able to play for an NBA coach [Jay Triano], playing with NBA players, it definitely taught me a lot about the game, and definitely helped me coming into Duke," Barrett said. Krzyzewski agreed Barrett's time working with Triano was invaluable. Triano was an assistant to Krzyzewski on the U.S. men's team that won the 2010 world championship, and the Duke coach called Triano "one of my best friends." "Obviously any time you can spend playing with Jay Triano as your coach you're going to be better as a person and as a player," Krzyzewski said. "And R.J. has always played older than he is all the time. Like I grew up in Chicago with my older brother, he was a really good player, and I went to the schoolyard every day and he would let me play with the guys who are four or five years older. You get better. "So this experience that he's had with the Canadian national team and the younger [Canadian] teams has been invaluable. R.J has always been involved with older really talented groups, and with outstanding leadership . . he's just flourished, he's very unique, he's way ahead of the game at this time in his career." Since Duke has had just six limited practices, Krzyzewski said the tour is about team-building for a group of young players he spoke fondly of Friday. "There's great chemistry, enthusiasm, I love my group," he said. Barrett said his team expects to tested by the three Canadian schools. "It will definitely be interesting, we really haven't been together for that long so to go against a different kind of competition other than ourselves will be a challenge for us."